Idea: Electric lifts along roads. 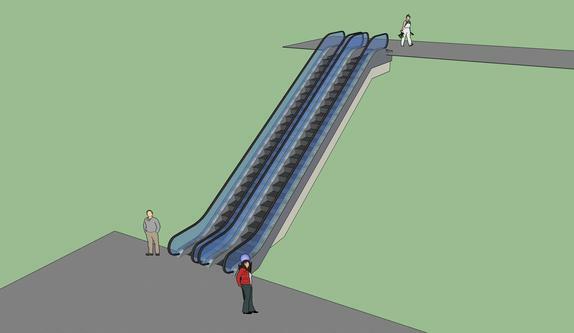 Lifts similar to the escalators in department stores, installed alongside roads on certain hills, can provide a form of powered transportation to anyone on foot, or with a lightweight non-motorized vehicle, such as a bicycle, tricycle, wheelchair, or even certain Kinetic sculptures. The economy and efficiency comes by having a system with one stationary motor, rather than everyone carrying around their own, and starting and stopping with all that extra mass. Once on top of a hill, say Lawrence street, the person could ride, skateboard, or otherwise coast downhill to many other points, from which they again may catch a lift, such as from Taylor going up Washington. Lifts could also be installed along County roads, but would probably get less use. This is a form of mass transit which incorporates the individual having total decision-making power over when to use it, and where to go from there, using the distributive nature of gravity. Gravity is the physical problem to overcome in any transportation system, so why not use it to our own advantage? These kinds of proposals require a community effort, and would create a community benefit. I leave it for others to create ways for individuals to contribute financially.